Is There A Difference in Blood Pressure Between Your Right and Left Arms? The skeptical cardiologist has a question for all patients who have elevated blood pressure: has your doctor ever taken your BP in both the right and left arms? Have you ever noted a difference in the systolic BP between arms (interarm difference or IAD) when you do home recordings? Although UK and USA national hypertension guidelines recommend measuring BP in both arms on a first visit and most PCPs are aware of the recommendation, only 30% agree with it and few actually adhere to it. (2007) Hypertension guideline recommendations in general practice: awareness, agreement, adoption, and adherence. Br J Gen Pract 57(545):948–952. 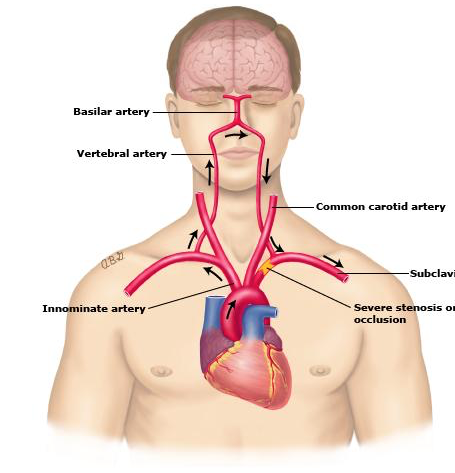 Graphic depiction of blockage of left subclavian artery indicating that the collateral flow is stolen from the brain via reversed flow down the vertebral artery. Thus subclavian steal syndrome. A consistently lower BP in the left arm compared to the right arm can be a sign of a serious and correctable congenital heart disease called coarctation of the aorta. The true BP (i.e. the one we should be treating) is the higher of the two. Thus, if you do have a consistent IAD, you should only measure the higher one for monitoring BP. they speculated that if PCPs were given better justification and precise details on how to reliably measured the IAD they would be more likely to do it. I’ve mentioned the “why” for measuring IAD above. The “why” is so compelling that if you have hypertension or pre-hypertension (SBP 120-140) and you’ve never had the BP compared in both arms you should do it yourself. The “how” of IAD is more complicated. In a subsequent post I will give my recommendations on how to reliably measure IAD and I will tell the story of a 75 year old competitive ice hockey player with a totally blocked subclavian artery to his right arm. Got it now! Thanks. Golf is a game in which the slowest people in the world are those in front of you, and the fastest are those behind. My physicians are unimpressed with inter-arm difference. Performed with manual equipment, and 100% correctly, R 132/80, L 114/70, with coronary artery disease, PAD, elderly, etc., but no events as yet. One month ago R178/95, L 168/90. No previous history of hypertension. I figure I’m toast. As always, good that you write to this issue. The left arm bp is 10 to 18 mm Hg lower than the right. This could be due to some narrowing in the left subclavian artery related to the PAD or to coarctation of the aorta. 2. Consider getting an echocardiogram to rule out coarctation of the aorta.